There was just something about the Ozark Club. From 1933 to 1962, this nightclub in Great Falls became an entertainment sensation sought far and wide. Imagine the swirls of tobacco smoke filling the air, the saxophone wailing, and the gin flowing in a cornerstone of Great Falls history. After 15 long years, Prohibition ended in Montana and Leo LaMar opened the Ozark Club in a small house. An immediate success, the Ozark Club moved to 116-118 3rd Street South, where it stood for 27 years. 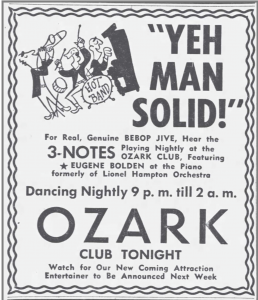 The Ozark Club was the star of Montana nightlife in 1930s into the 60s. 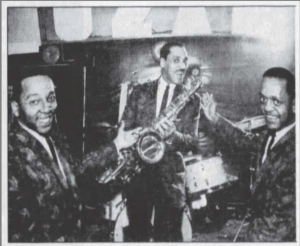 World War II brought white and black soldiers to Great Falls and in that time, the Ozark earned a reputation as the best place between Chicago and the West for Jazz. Beginning in the 30s, Big Band Jazz enjoyed nation-wide popularity, and the novelty of Dixieland Jazz drew many to the Ozark to hear this new spin on a beloved music form. Ozark Club entertainment included musicians, tap dancers, exotic dancers, and comedians. Some of the best memories of the Ozark are when Joe Louis visited the Ozark and gambled in the basement, when the Harlem Globetrotters spent their off-court hours at the Ozark, and on several occasions when Lionel Hampton and his band spent all night playing at the Ozark until morning light, with the expressed permission of the Police of Chief. One legend of the Ozark Club was Jack Mahood, a farm hand from Big Sandy. Every week Mahood packed his bag, grabbed his alto sax, and took the train to Great Falls. Jack had his place on the bandstand alongside Bob Mabane and the Ozark Boys. 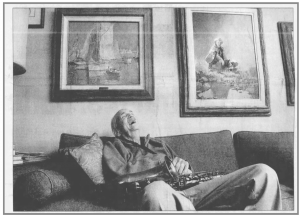 In the years Jack played at the Ozark, he got to meet some of the greats, including Pop Gates, Oscar Dennard, Stan Turrentine, an up-and-coming Red Foxx, and Miss Wiggles, ‘the Wiggleinest woman in the West.’ These musicians and celebrities would achieve world-wide recognition, but they got their start on the ‘Chitlin Circuit‘ that stopped at the Ozark because of its reputation as the best jazz club in all of Montana. The Ozark was unique. In a time where segregation existed, even in the West, Leo emphasized that “All are welcome” at the Ozark. A night at the Ozark was an exciting experience. Nestled on the edge of the railroad district, the Ozark was surrounded by seedy bars and houses of ill repute. Patrons had to climb a poorly-lit flight of stairs. At the top, they entered the dim and smoky room where music filled the air, and where ‘Jazz washed away the dust of everyday life.’ The nightlife experience the Ozark provided then was adventurous and daring. People welcomed a night at the Ozark where they could rub shoulders with some of the best musicians they would ever see. The Ozark attracted an interracial crowd of patrons that sipped drinks under the watchful eye of Harvey ‘Woogie’ Clayborn. And just like that, amidst suspicious deaths, prostitution, and illegal activity, the fortunes of the Ozark Club changed in the late 1950s. A fairly open secret among some patrons was Bea LaMar‘s ‘gravy train’ house of ill repute at the nearby LaMar Hotel (later the Doyle apartments) and in August 1957, a newspaper article revealed sordid details of the hotel’s operations. A few years later, Leo Jr died with four friends in an early morning car crash. One year later, in June 1962, Leo suffered a fatal heart attack. A mere three weeks after Leo’s passing, a late night fire forced an emergency evacuation of staff and patrons as the Ozark Club burned to the ground. While never confirmed, many people felt the fire was not accidental. While the physical location of the Ozark is gone, the memories live on. You can experience the legacy of the Ozark Club at the History Museum, open Tuesday-Friday 10am-5pm. 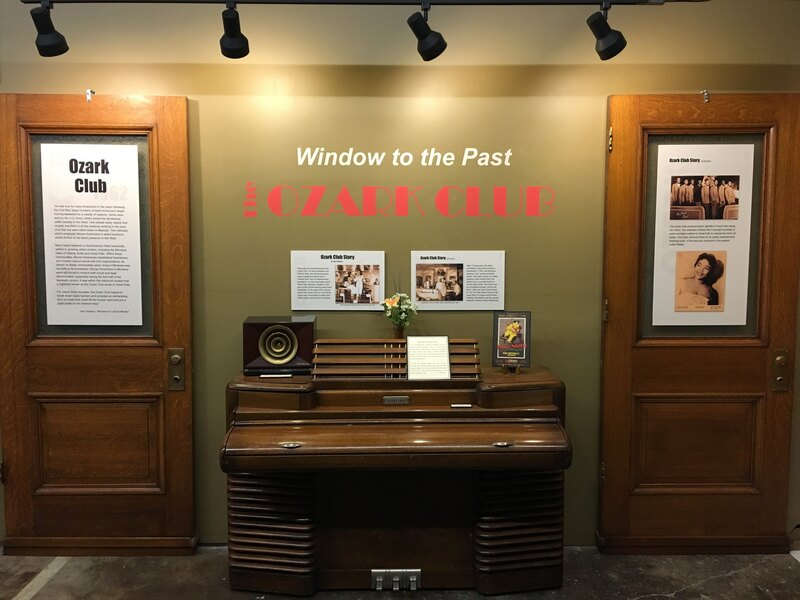 An entire room is dedicated to Ozark Club memorabilia, including a 1925 Chickering grand piano, Jack Mahood’s saxophone, signed pictures of the Ozark’s many performers, and more. For an amazing night of Jazz, plan a visit for the Museum’s Jazz nights with music from the Bud Nicholls Band.